Saving money is an important factor in your overall finances. It’s something that we all need to do. Many people find it difficult to start saving money, but it doesn’t have to be hard. It get it, it can be discouraging to think about saving money, especially if you’re living from paycheck to paycheck or trying to get out of debt. The truth is, you don’t need to turn your world upside down to start saving. 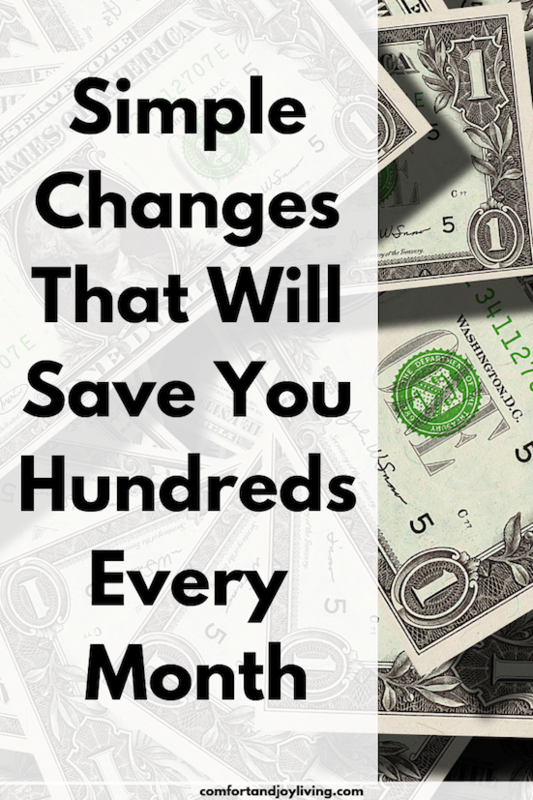 There are plenty of simple ways that you can save money every month. A small amount here and there can really add up to a lot when you think about it. If you aren’t saving money, you’re jeopardizing your future. You probably don’t have an emergency fund, which can cause you to get into debt if any unexpected expenses arise. You’re not alone if you have no savings. In fact, 40% of Americans can’t cover $400 in emergency expenses. What would happen if your car broke down or a major appliance in your home stopped working? Well, without any savings, you would have to use your credit to pay for these repairs. This will cause you to get into debt. And, if you can’t save money now, how are you going to pay off debt? This is where things start to snowball. So, now you not only don’t have any savings, you have more bills to pay. Saving money isn’t that hard, you don’t have to think of crazy, out of the box ways to save money or become one of those extremely money savers. In fact, this is a sure fire way to quickly get discouraged and give up. The key to saving money is to start living below your means. Yup, it’s that simple, living on less money than you make is how you can start saving effortlessly. You don’t need to turn your life upside down or deprive yourself of things that make you happy. It’s about developing frugal money habits. Let me show you how easy it is to start saving money every month by just making some small and simple changes. By making a few tweaks to your spending priorities, you’ll be on the fast track to saving money in no time. Saving money doesn’t necessarily mean that you have to give up the things that you enjoy. You just ned to look for cheaper alternatives to some things that you spend money on daily. By doing this, you will still be able to meet your needs and start saving money too! For instance, take those specialty coffees daily, one Starbucks coffee costs between $3 - $5 each. You can buy flavored coffee for less than $10 a can or creamers in your preferred flavor for less than $5. At the rate of one specialty coffee a day, these two options would last you over a month, so you would spend $15 a month making them yourself at home instead of wasting about $90 a month for purchasing ONE daily drink at your local coffee shop. Cha Ching…$75 a month save on one item alone. What about bottled water? It would be more cost effective to buy a water bottle with a filter, a filtered water pitcher or a water filtration faucet attachment. Any of these items cost between $10 and $30 as an initial investment and less than $5 a month for replacement filters. So, let’s say that you buy 3 bottles of water daily; after your initial investment—which will still save you money—you would save over $120 a month and $1440 a year by using a cheaper alternative. Again, this is a short list, but I just want to give you an example of how substituting for less expensive options can save you so much money. So, just with the 5 items listed above, this totals to $131.00 a week—this is low-balling the total. Those small items also total $556.75 a month. Just by making a few minor changes, you can save over $6,800 a year! Looking for cheaper alternatives can truly add up to a lot of money saved. Besides finding cheaper alternatives to save money, saving on groceries is one of the easiest ways to reduce your monthly expenses. We all spend money month after month on groceries, so it just makes sense to try and cut back on the amount of money that we spend on food. There are many money-saving strategies when it comes to our grocery budget. Here is a short list. If you were to choose just one of these options to save money on groceries, I would suggest meal planning. It’s the easiest way to save money and it’s less time consuming than the other options. And we all know that time is money, right? Just by planning ahead, you can easily save hundreds of dollars a month on groceries. Technology can be very helpful in your quest to save more money. There are literally tons of apps, websites and extensions that can save you more money. Ebates is a great way to save money when shopping online. Ibotta and Checkout51 are also awesome if you want to save money on groceries and everyday items. Walmart savings catcher is an app that reimburses you if they find lower prices on items that you bought. Simply scan your receipts and let the app do the rest. You can us Paribus for online purchases. It searches the Internet to see if there is a lower price on items that you recently purchased. If it finds lower prices, it negotiates to get you a refund for the price difference. Consignment shopping is another easy way to save money on the things that you need. Why pay full price for item that you can buy for pennies on the dollar at a consignment shop? There are so many things that you can save money on at consignment shops. Clothing is what comes to mind when most people think of consignment shopping. But there are so many other things that you can get for cheap. You can find household items, dinnerware, furniture, books, toys and so much more. If you’ve never stepped foot in a consignment shop, then you are in for a wonderful surprise! Energy consumption is a huge monthly expense that we feel that we have to deal with. The thing is that we all have a choice to do things to reduce our energy consumption to save money and the planet at the same time. These are just some ways to reduce your energy consumption. All these small changes really do make a huge impact on your wallet. I’m sure that you’ve heard the term “patience is a virtue”. Well, when you’re looking to save more money, patience is a must, especially if you need to make a major purchase. When contemplating making a big purchase, take some time to think about it. We’ve all been in a situation where a salesperson shows us all the bells and whistles that come with whatever it is we’re looking to buy. It’s very easy to get caught up in the moment of wanting something that we don’t necessarily need because we’re being pushed in that direction. Only to realize later on that it was a huge mistake and waste of money. Instead, take a day, a week or even a month to think if the price tag is really worth it. Do you really need all those extras or would a basic model meet your needs? As you can see, saving money s really not all that difficult when you make small changes to things that you do every day. All it takes is some practice and being mindful of where your money is going and what it’s being spent on. Take baby steps and try a few of these money saving tips at a time. Once you master those, add a few more. It’s so much easier to stick with a savings plan when you make small changes. Are you ready to get out of debt and start living the life that you deserve to live?